This stunning gold and ivory, glass beaded gown (circa 1945-1947) was a terrific find that Andrea snagged before Maison Marcellé even opened its doors. Mannequin Geneviève wore it exquisitely for quite some time until the day a very special lady came into the Boutique. “I bought the gown from a vintage dealer before I opened the doors to Maison Marcellé and knew that she would have to patiently live with me until the PERFECT woman came in to claim her. The gown hung on Geneviève quite majestically and was admired every day by someone too tall, too short, too low-waisted, too high-waisted. Because of all the intricate beading, sending it to Lorrie Rogers, our preferred seamstress, was not an option. 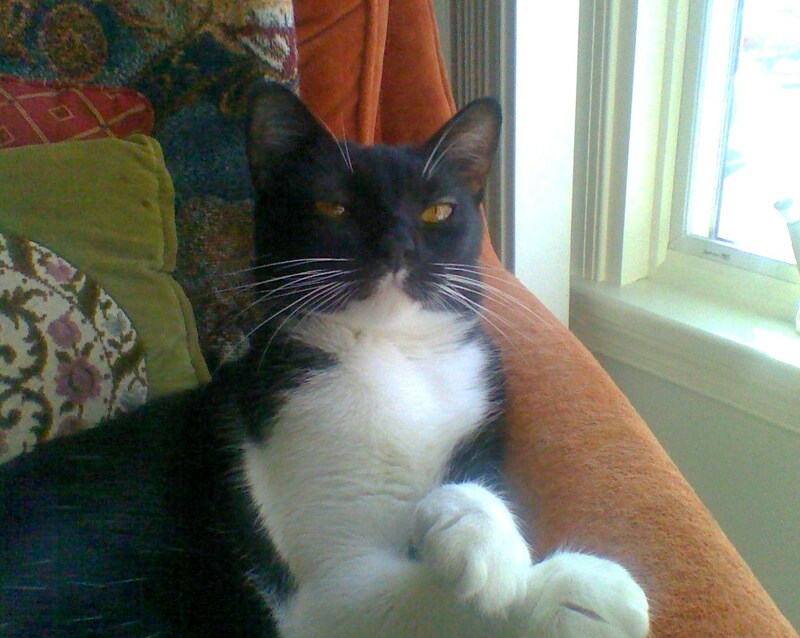 “Sissi bears a striking resemblance to Coco Chanel, speaks English très better than I speak French, but neither of us has mastered each other’s native tongue. Still, we share a passion for fashion and our appreciation for each other’s style translated into an instant friendship. “I spotted a pair of vintage (circa 1950-1955) ‘Séduction de Paris’ gloves in the original box. It was my last night in Paris and I’d already packed three huge boxes of French fashion fabulousness and dropped them off at FedEx to be shipped home to Maison Marcellé, but I was able to find room in my carry-on for this gem. 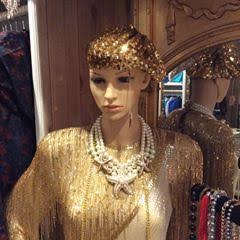 Wouldn’t you just love to own an accessory from this truly elegant era? It was a time when no well-dressed Parisienne would dream of leaving home without her hat and gloves. 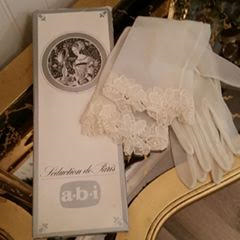 These gorgeous lace gloves in the original box with the faint scent of its owner’s talcum powder are available right now at Maison Marcellé. 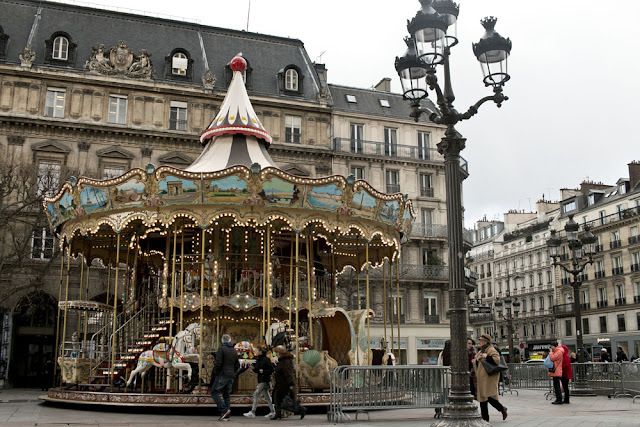 Don’t miss this opportunity to own a piece of vintage Paris. 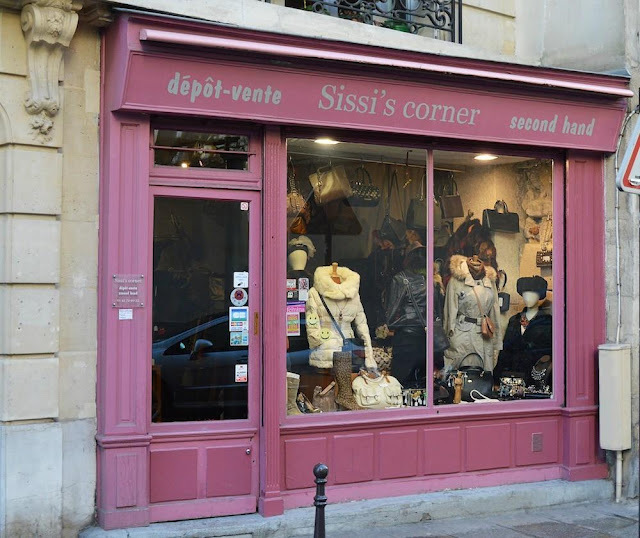 Le Marais (from marécages – swamps) is one of my absolute favorite Parisian quartiers in which to shop, dine and just wander about and get blissfully lost. It’s constantly bustling with activity and bursting at the seams with creativity. Andrea shares my love of this eclectic area and some of her best finds, large and small, have come from there. 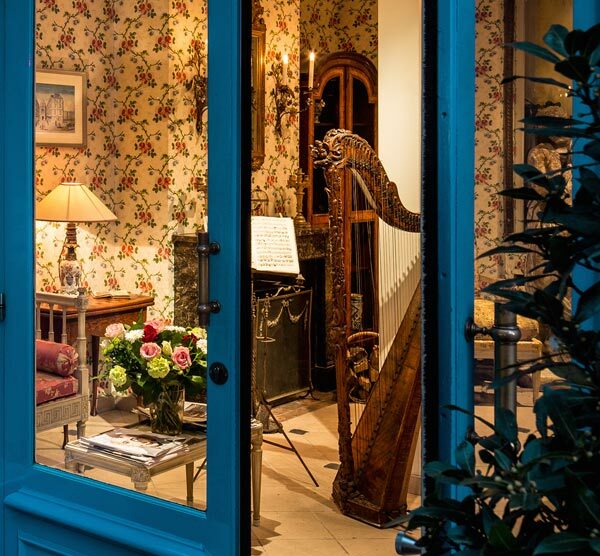 It’s also where she loves to stay, and her favorite hôtel particulier (once a private residence) is the charming Hôtel Caron de Beaumarchais right in the heart of the district. 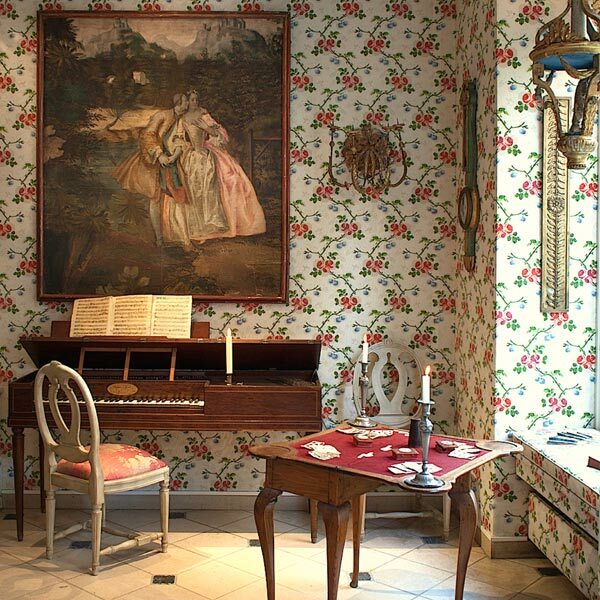 You have only to cross the threshold of this charming hotel to find yourself in the 18th century salon of writer Beaumarchais complete with a piano-forte from the period. Among other unforgettable characters, Beaumarchais (né Pierre-Augustin Caron de Beaumarchais) created the immortal Figaro, who inspired Gioachino Rossini and Wolfgang Amadeus Mozart to compose two of their most famous operas -- The Barber of Seville and The Marriage of Figaro, respectively. Andrea loves this cozy hôtel de charme and its attentive staff who always make her feel like a valued houseguest. She is already looking forward to returning in the fall for her next buying expedition. 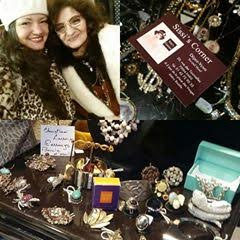 I can’t wait to see what treasures she will bring back to add to her beautiful jewel box -- the Maison Marcellé. Reluctantly, we must take our leave of Maison Marcellé (for now), but I know I will be back and I hope you will, too. So do I. Won’t you join us? Lovely tour had me missing Paris of a bygone era. I was born too late. I feel your pain, Linda. I, too, often feel as if I were born in the wrong time, and then I think about all the wonderful advantages we enjoy having been lucky enough to be around at such a time of amazing innovation. 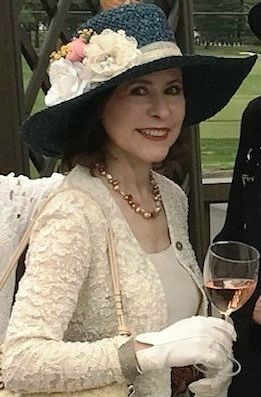 My antidote against the vulgarity of the present is to create a lovely little cocoon of civility and elegance in my immediate surroundings. I have no doubt you have been able to do the same in your life. Oh what a treat to read and see. Dear Katie Isabella, we all need our treats on a regular basis. Wouldn't you agree? So glad you were able to enjoy these. It is like you took us by hand into Paris and never had the feeling this is in your backyard area! 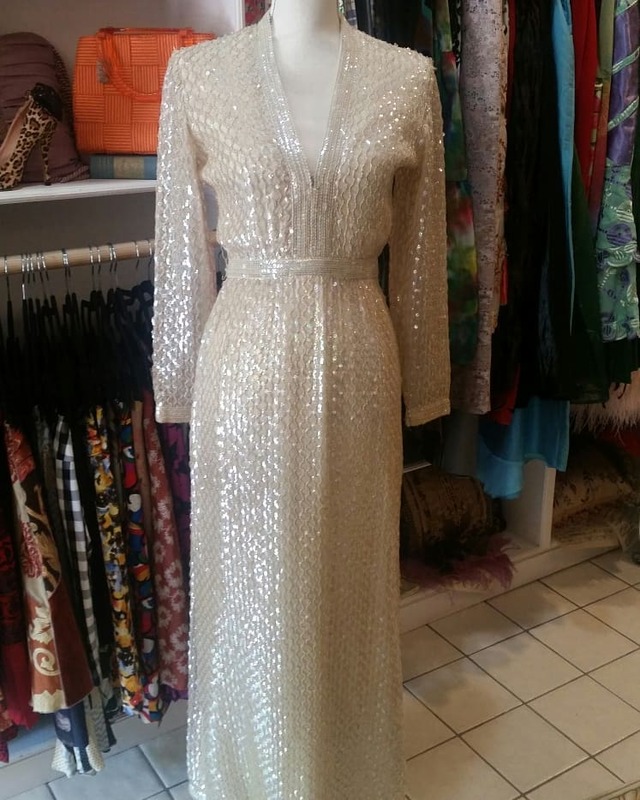 What a great match for the 1940s beaded gown. 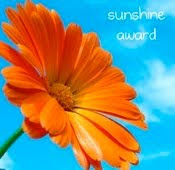 It makes one very happy if a person with true passion for the item comes by. It is, indeed, amazing what you can find in your own backyard, n'est-ce pas? I am very blessed with mine. Isn't that beaded gown spectacular? And the lucky lady who now owns it looks spectacular in it. You are so right about passion keeping one happy, whether in your personal life, professional life or, if you are very blessed, both. I know exactly how you feel, Swami. I miss Paris. It's been almost a year since my last trip. It's time. I am delighted to hear from you, Kathi. When Andrea sent me that picture, I knew I had to use it. You look amazing in that spectacular dress. It might have been made for you. I assume you bought it for a very special occasion? I'll bet you turned heads the night you wore it. Do you ever wonder who first wore it? I am very glad you are In My Own Backyard. Can't wait to meet you, too. Drop me an email and we'll make it happen. It never occurred to me, but you are so right. Beaded gowns are always heavy. I remember Mme Mère's collection of beaded evening gowns. They were very heavy indeed, but then didn't Ginger Rogers do some of her most beautiful dancing w/Fred in heavily beaded gowns? And she was so light on her feet! Hi Patricia, So nice to hear from you and I am happy you liked my comment and even happier that it deed not go astray, as so many of my readers' comments have recently on Blogger. I, too, am no longer getting emails when someone comments, but have no idea how to get that corrected. If you have any advice on that, I'd be most grateful to receive it. You can contact me directly at frenchtouchimage@gmail.com. I am delighted to follow you back and have registered through Blogger Followers. Wasn't that gown just too stunning? 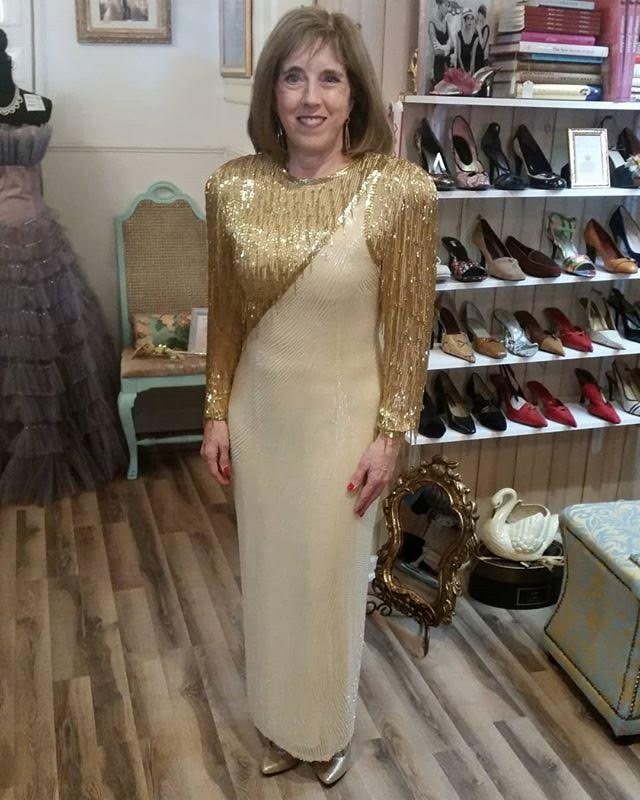 As it happens, I stopped down yesterday to see Andrea (Maison Marcellé) and she told me that it took two people to get the gown off the mannequin for Kathi to try it on. It was that heavy!! I am ashamed to admit that we had huge steamer trunks in the basement of Mme Mère's house with nothing but evening gowns, most of them heavily beaded, and I didn't save any of them, as I thought no one would be interested in them. Some of them were, indeed, in beautiful shape. How wrong I was! Of course, Mme Mère was much taller than I, so I couldn't wear them and you can't really alter them. They have to fit perfectly from the outset. So glad we were finally able to connect. Thanks for stopping by. As always, thanks for all your lovely comments. content, that's what I need. Thank you for keeping this web-site, I'll be visiting it.